Interest in grand editions of the Stalin era is nostalgia for the time past, a sort of a post-Soviet, post-communist Oedipus complex. We were witnesses to an unprecedented historic experiment, its participants and victims. We have had to live in two historical eras, in two different economic systems, to practise mutually hostile, mutually exclusive outlooks. We are all victims of Stalin's regime, for its victims are not only the generations of his contem?¬poraries, but also the subsequent generations. Our historic experience is the experience of iconomachy, we treat the past like barbarians, destroying monuments. Today we are able at last to regard history as a cycle of inseparable events. The aesthetization of the past, the search for the grand style is not so much lack of wisdom or myopia affecting the whole nation as its defence reaction, because people have to go on living somehow together with their terrible history. And if in the early-middle 1990s we felt a little ashamed of this history, today we are again ready to be proud of it, that is to stick to our aberrations. Historical, personal pain is disappearing and we are less prone to take the moral high ground when dealing with works of art. I turn the leaves of illustrated propaganda editions and become scared, terrified, but filled with admiration as well. This ambivalence appears every time I open books designed by Lisitsky, Rodchenko, Stepanova or Telingater. The Stalin Book draws our attention by its artistic value, and studying this material not only helps expand our knowledge but also change the accents in the history of Russian and Soviet book art. There is a certain lacuna in established beliefs about the stages of book development in the first half of the 20th century. The era of the Russian book which started with the Mir Iskusstva (World of Art) movement, was then transformed by futurists and later by constructivists, went on into the 1930s. In bibliophile practice and art criticism the Soviet book of the 1930s is reduced to children's books, illustrated editions, GIHL (State Publishing House of Literature) and Academia. A whole stratum is still not researched. It is the Stalin Grand Book, which includes The Soviet Union builds socialism, Worker-Peasant Red Army, Food Industry by El Lisitsky, Moscow under Reconstruction, The First Cavalry, Red Army, 10 years of Uzbekistan by Varvara Stepanova and Alexander Rodchenko, Railway Transportby Nikolay Troshin and others. Without them, the history of book art seems not only incomplete but also inauthentic. And talking of peaks, the Grand Book is a peak as absolute as the Avant-Gard book which precedes it. It is thanks to books of that decade that the profession of book artist developed, along with its specialization: layout artist, illus?¬trator, cover-maker, sign-writer and above all designer. The Book became a universal disci?¬pline, began to solve problems of space and composition, appeared in large format, regained the character of bibliophile editions. The books which are nowadays considered masterpieces of book design, which are among the most famous photobooks of the centu?¬ry, were published literally within a few years of each other. 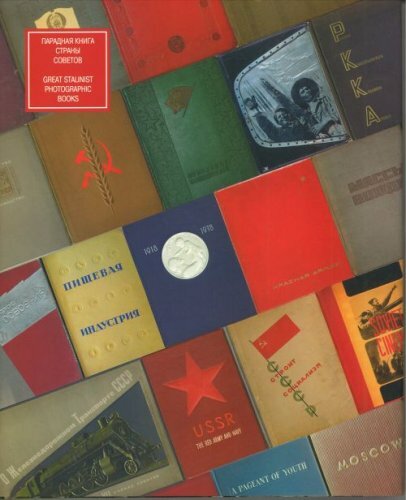 Great Stalinist Photographic Books is the first publication specifically devoted to Soviet photobook and propaganda album design. The edition includes an historical essay and the description of more than 70 books of 1920s-1930s, most of which are practically unknown to bibliophiles and art critics, and to the general public as well. In Russian with English summary.